A former Chinese security official, whose attempted defection to the United States was rejected by the Obama administration, officially requested asylum during his 10-hour stay at the U.S. Consulate in Chengdu, China, according to an official Chinese report. The Communist Party of China Central Committee’s report on Wang Lijun confirms earlier reports of his failed Feb. 6 defection. Wang’s move triggered an unprecedented series of power struggles within the top ranks of the ruling Communist Party that are continuing amid reports on Chinese websites of high-level political struggles—and even a military coup. Tanks and armored vehicles were reported moving throughout Beijing last week following the ouster of leftist Chongqing Communist leader Bo Xilai amid corruption allegations. A second senior communist official, Politburo Standing Committee member and top security chief Zhou Yongkang, was also said to be facing demotion or ouster amid the coup rumors. However, Zhou emerged on state television Friday, an indication that he has not been purged in what appears to be a major split between leftist, hardline communists and reform-oriented communists. The power struggle, which is playing out largely in secret, appears to be the most serious political split within the Party leadership since Mao Zedong’s wife and three others were arrested and removed from power. Regarding Wang’s defection, China’s dissident Boxun news service posted an audio broadcast of a Chinese official who read the "Report of the CPC Central Committee on Findings and Assessment of Wang Lijun's Unauthorized Entering and Staying at the U.S. Chengdu Consulate General." The authenticity of the report was independently verified, and first reported, by the New York Times. China’s ruling communist party uses such broadcasts to convey official messages to party members. 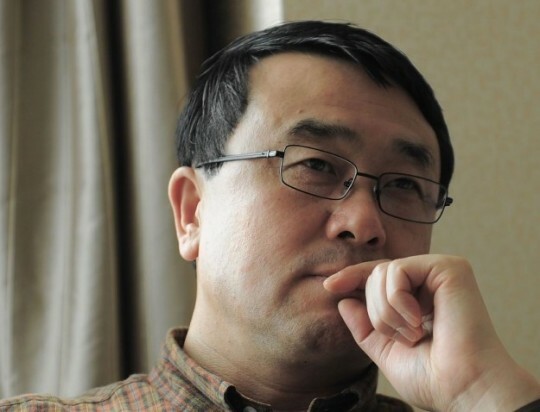 "Wang Lijun believed that his personal safety was threatened, and he decided to flee," the report said. "In the afternoon of February 6, without prior authorization, Wang entered the U.S. Chengdu Consulate General alone." Once inside, Wang spoke to U.S. officials "about relevant exchange and cooperation projects, then he asked for asylum," the report said. "Subsequently, upon request by the American side, he filled out an application form for political asylum," the audio broadcast, posted on YouTube, stated. "In the evening of February 7, after a face-to-face talk with a comrade directly dispatched from the CPC Central Committee, Wang Lijun agreed to voluntarily leave the U.S. Chengdu Consulate General." A State Department spokesman declined to comment on the reported asylum request. House Foreign Affairs Committee Chairman Ileana Ros-Lehtinen, whose committee is investigating the failed defection, also declined to comment through a spokesman. The March 15 document was read to rank and file party members at a Communist Party committee meeting in Chongqing, a common practice for internal party operations. The report recording, in Sichuan dialect, also stated that Wang’s attempted defection was triggered by discoveries made by several police investigators in Chongqing, implicating Bo’s family members were guilty of corruption. Wang informed Bo on Jan. 28 about the findings and that several investigators were under pressure to resign because of concerns for their safety. Such corruption among senior officials is endemic in China, with hundreds of officials imprisoned or executed each year for such offenses as embezzlement and theft. The document contained four parts, including "Initial measures taken by the CPC to deal with the Wang Lijun affair; initial findings of the affair; the Communist Party’s decisions on the matter; and things to be done now and next steps." Gordon Chang, a Chinese affairs specialist, said from the report it appears the State Department rejected Wang’s asylum request. "Wang undoubtedly has blood on his hands, so there were sound grounds for turning him down," Chang said. "Yet, despite everything, there is one reason why State should have granted him protection. By turning Wang down, we discouraged other Chinese officials from seeking our assistance." The United States should be encouraging Chinese officials to flee "a Chinese leadership that has, over the course of decades, undermined the United States, sometimes on critical issues," he said. "We should not help the Communist Party maintain itself in the face of unprecedented challenges." According to a translation of the Party report, Bo was upset by the accusations of family corruption and arranged for Wang to be fired as police chief and demoted to an education position. The Ministry of Public Security did not approve the demotion by standard procedures, and its irregular nature raised eyebrows. After Wang’s demotion, Chongqing authorities began investigating Wang’s subordinates involved in the Bo family probe. The leadership split was reflected in an editorial last week in the state-run Global Times, a Party newspaper that takes hardline, nationalist positions. Chinese editions stated in an editorial that the purge of Bo had set off discussion, and "we believe the central party leadership has accelerated its work in response to the political concerns of the public." "We hope they can come to a conclusion faster. The faster that we hear an authoritative voice, the clearer that society can be, and the public will be more stable," the newspaper said. "The whole of China is waiting for the party to speak." The editorial appeared to be an effort by party propagandists to try to end the speculation surrounding Bo’s ouster and the apparent power struggle. China will hold a major party congress in the fall when current Party leader Hu Jintao will give up some power to current No. 2, Xi Jinping. A report by the congressional U.S.-China Economic and Security Review Commission, made public Friday, stated that the "dramatic" events in Sichuan province surrounding the Wang case were likely the cause behind Bo’s ouster. According to the report, "At the time of Wang’s departure there was a stand-off outside the consulate between a large number of police from Chongqing (a long drive from Chengdu, and across lines of political jurisdiction) who had surrounded the building, and unidentified security personnel answering to central government authorities." The report said Wang dropped out of sight after he left the consulate and that Chongqing authorities on Feb. 8 stated that Wang had undergone "vacation-style treatment" for overwork, stress, and depression. According to the Chinese report, Wang traveled to Beijing on Feb. 8 and that Qiu Jin, deputy head of the Ministry of State Security, China’s civilian political police and intelligence service, was on the same flight. "Another intriguing element is suggested by the fact that Zhou Yongkang—the [Politburo Standing Committee] member in charge of the security and intelligence portfolio, and a figure closely linked to Jiang Zemin—may have been present in Chongqing on February 8, ostensibly to take part in a legal conference," the congressional report said. The report said Wang’s replacement as Public Security Bureau director in Chongqing, Guan Haixiang, "appeared to be a not-terribly-subtle move by Hu’s… faction to assert authority over the Chongqing city security apparatus at the expense of Bo Xilai’s own authority, and further bolsters suspicions that Hu Jintao and his supporters had a hand in this apparent strike directed against Bo Xilai." "The animosity between the Hu [Jintao]-Wen [Jiabao] team and Bo is an open secret: Premier Wen, in particular, has made indirect but pointed comments that have been strongly critical of Bo’s administration in Chongqing," the report said. The report said that while the facts about the Wang case remain hidden, "the unfolding drama in Chongqing carries clear implications for the coming leadership transition, and could yet prove to be ‘an earthquake event in Chinese elite politics, with the potential to change the balance of power among competing factions’ in the lead-up to this year’s CCP leadership transition." The report offered several theories to explain the Wang Lijun affairs, including that "Bo’s program to promote a revival of Maoism upset Beijing party leaders." "The current oligarchy of the PRC is based heavily on the survivors and descendants of the ‘revolutionary families’ persecuted by Mao during the Cultural Revolution, and Bo’s campaign may have unnerved some senior officials who clearly remember the years between 1966 and 1976," the report said. Meanwhile, the mayor of Chongqing said recently that he was ordered to use military force against the U.S. Consulate in Chengdu during the time Wang was holed up at the consulate. Chongqing Mayor Huang Qifan stated publicly that Bo Xilai had ordered him to use force if necessary. "After Wang Lijun's treacherous flight to the U.S. Consulate," Huang was quoted as saying on the dissident Chinese website Boxun, "Bo Xilai immediately ordered me to rush to Chengdu personally to get Wang Lijun back at any cost, including using force against the U.S. Consulate General if necessary!" During the standoff, police cars and plain-clothes police agents surrounded the consulate. Photos posted on Chinese websites also showed armored vehicles and tanks massing in a suburb of Chongqing, which reports said were preparing to travel to Chengdu in an operation to get Wang. Huang advised Bo against using force and to hold off and await directions from Beijing. In response, Bo ignored the advice and said he would take full responsibility for any attack on the consulate. The plan to use force was first reported in the newsletter East-Asia-Intel.com. This entry was posted in National Security and tagged China, Wang Lijun. Bookmark the permalink. Bill Gertz is senior editor of the Washington Free Beacon. Prior to joining the Beacon he was a national security reporter, editor, and columnist for 27 years at the Washington Times. Bill is the author of seven books, four of which were national bestsellers. His most recent book was iWar: War and Peace in the Information Age, a look at information warfare in its many forms and the enemies that are waging it. Bill has an international reputation. Vyachaslav Trubnikov, head of the Russian Foreign Intelligence Service, once called him a “tool of the CIA” after he wrote an article exposing Russian intelligence operations in the Balkans. A senior CIA official once threatened to have a cruise missile fired at his desk after he wrote a column critical of the CIA’s analysis of China. And China’s communist government has criticized him for news reports exposing China’s weapons and missile sales to rogue states. The state-run Xinhua news agency in 2006 identified Bill as the No. 1 “anti-China expert” in the world. Bill insists he is very much pro-China—pro-Chinese people and opposed to the communist system. Former Defense Secretary Donald H. Rumsfeld once told him: “You are drilling holes in the Pentagon and sucking out information.” His Twitter handle is @BillGertz.